Do you enjoy art, architecture and culture? Always felt drawn to the irresistible atmosphere of the Scottish highlands? If you answered yes to both questions, the House for an Art Lover in Bellahouston Park, Glasgow might be something for you. 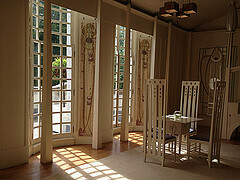 This cultural attraction and popular tourist destination, which doubles as a place where weddings and other events are organized, was designed by the renowned Scottish architect Charles Rennie Mackintosh, a pioneer of the Modern movement, who was born in Glasgow on the 7th June of 1868, and died in London on the 10th December 1928. The House for an Art Lover has been designed to closely resemble the materials and styles used in the 19th century, and contains several interesting rooms. When entering through the small front door, the first room to be encountered is the Main Hall, a two storey space that provides a direct connection to other important rooms, such as the Dining Room, where the dining table with the high-back chairs are surrounded by intricate gesso panels on the walls. Another interesting room is the Music Room, where a cascade of color and extravagant design grabs the visitor’s attention. The Oval Room, originally designed for the ladies to withdraw, is characterized by a fireplace and a stained glass ceiling light. The Upper Gallery is supported by broad columns and links the two ends of the house together. 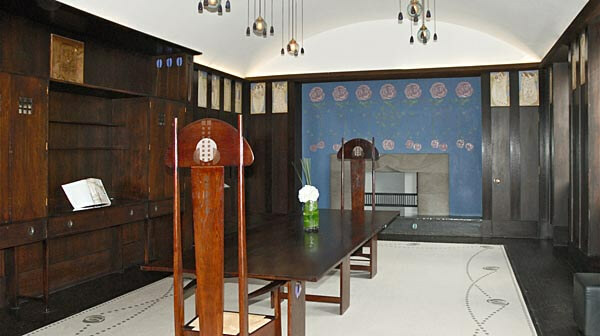 Finally, the Margaret Macdonald and Interpretation room offer a substantial amount of background information on both the House for an Art Lover and the other works by C.R. Mackintosh, through the modern medium of Apple computers. If you’re interested in art and architecture, the House for an Art Lover is the perfect way for you to spend a day in the great Scottish city of Glasgow. Open daily, some days only morning hours. Check the website before visiting. Last updated by Scott Richardson on 17 September, 2012 in Destinations. Bellahouston Park and House for an Art Lover are located very close to the city center, about a mile away. I am flying to Glasgow next month, it seems like this place worth a visit:) Is this far away from the city center?